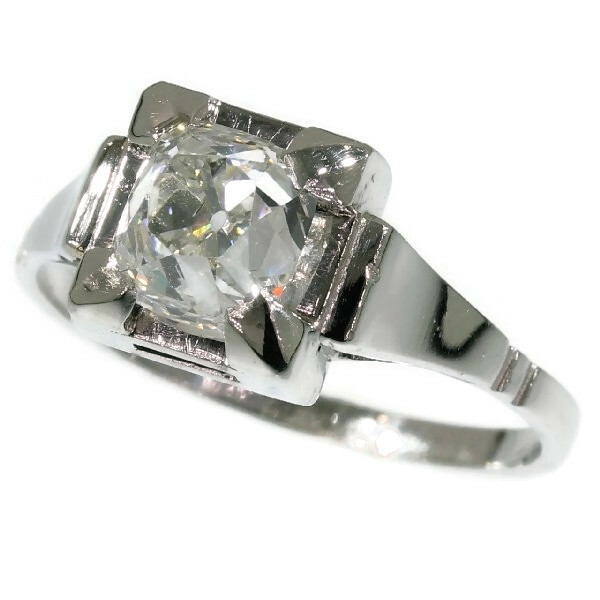 Art Deco engagement ring with high domed cushion cut old mine or peruzzi cut diamond: Description by Adin Antique Jewelry. From this platinum Art Deco ring, an early 17th century Peruzzi cut diamond in a square crown setting looms from afar as the dome of a Renaissance centrally planned temple. With this divine treasure around your finger, you'll be worshipped like a goddess on earth. We got the stone together with its old Dutch certificate made in 1978 but to be sure we have had a new certificate made by IGI (see pictures). Style: Between Art Deco and Interbellum - Art Deco is an eclectic artistic and design style which had its origins in Paris in the first decades of the 20th century. The style originated in the 1920s and continued to be employed until after World War II. The term "art deco" first saw wide use after an exhibition in 1966, referring to the 1925 Exposition Internationale des Arts Décoratifs et Industriels Modernes that was the culmination of high-end style moderne in Paris. Led by the best designers in the decorative arts such as fashion, and interior design, Art Deco affected all areas of design throughout the 1920s and 1930s, including architecture and industrial design, as well as the visual arts such as painting, the graphic arts and film. At the time, this style was seen as elegant, glamorous, functional and modern. The interwar period (1918–1939) is understood, within recent Western culture, to be the period between the end of the First World War and the beginning of the Second World War. This is also called the period between the wars or interbellum. Style specifics: This is something between Art Deco and the Interbellum. The Interbellum is the period between the two World Wars and one can recognize a transition from the Art Deco style to the Retro style. Total diamond weight: approx. 1.83 crt. More background information: This particular shape of diamond is called the Peruzzi cut.